Glad you drifted in! 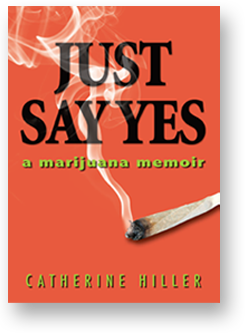 This is a companion website to the book JUST SAY YES: A MARIJUANA MEMOIR by Catherine Hiller. The book is about one woman's experience as a long-time pot smoker and has been featured in The New York Times, the Huffington Post, and Elle. This website is a place for your weed memories and reminiscences. It’s for those who have enjoyed lighting up and would like to share their stories. It’s a site where we can have a nodding acquaintance with each other in happy anonymity. Come join the party! Other sites advocate the legalization of cannabis or provide topical, horticultural and medical information about it. This site is more personal. It’s a site for your best (and worst) marijuana memories. Here are some topics to write about. The goal: a range of voices from far and wide. In a world that pushes us apart, weed can bring us together! Take a deep breath… and read on. To comment or post, please login.